The FZ-F1 and FZ-N1 are the same device, but one runs Windows while the other runs Android, both offering the notorious ruggedness of the Toughpad family. Panasonic is well known for its Toughpad family of devices that consists of laptops and tablets, most of them targeting large businesses and military customers that need their portables as sturdy as possible. However, at this year's Mobile World Congress in Barcelona, the Japanese company announced its first smartphone, although they called it a "handheld tablet" - the 4.7-inch Toughpad FZ-N1/FZ-F1. 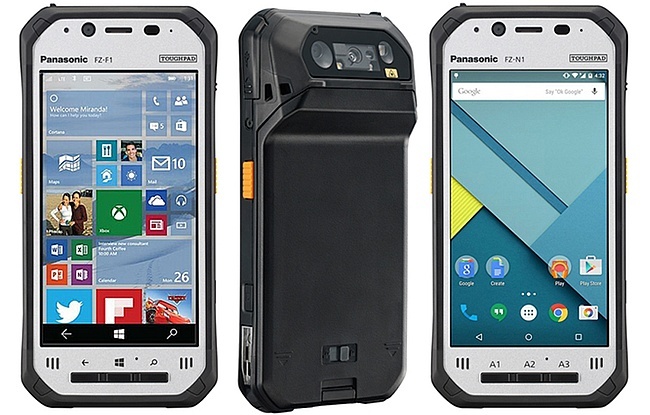 This upcoming Toughpad handset meets the IP65 and IP67 certification requirements. The WiFi-only variant of FZ-N1 is expected to hit the market next month starting at $1,499 USD while the voice model will follow this summer. The FZ-F1 will launch as a data and voice model this fall for an estimated street price of $1,599 USD. 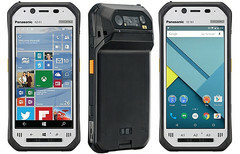 NEWARK, N.J.--(BUSINESS WIRE)--Panasonic, an industry leader in exceptionally reliable and innovative mobile computers, today added two new rugged handheld tablets to its diverse portfolio of enterprise-grade mobile devices – the Toughpad® FZ-F1 and FZ-N1. As the world’s lightest1 fully rugged handheld tablets, these 4.7” AndroidTM and Windows devices feature a quad-core Qualcomm® Snapdragon™ processor, delivering industry leading performance along with a purpose-built design and rugged credentials that live up to the brand’s heritage. Ideal for markets like transportation and logistics, manufacturing, retail and healthcare, the new Toughpad handheld tablets are well suited for a wide variety of applications, such as inventory management, shipping and receiving, delivery routing and parcel tracking, retail store line busting and bar code medication administration. “Enterprise and government users are looking to do more with handheld tablets than ever before,” said Jan Ruderman, Vice President, Business Mobility Group, Panasonic System Communications Company of North America. “The majority of handheld computer solutions in market today are using an antiquated OS and are vastly underpowered. Additionally, older devices aren’t compatible with today’s standard enterprise applications, offer poor voice and data features and are larger and heavier than they need to be. The Toughpad FZ-F1 and FZ-N1 handheld tablets give companies looking for an up-to-date, powerful, flexible and purpose-built solution, an excellent option that will improve efficiency, productivity and bottom-line performance for years to come.”Panasonic introduced the Toughpad FZ-F1 and FZ-N1 during a media event at Mobile World Congress in Barcelona. The Toughpad FZ-F1 & FZ-N1 feature an ergonomically designed, angled rear barcode reader that allows the user to scan items without bending at the elbow or wrist while also being able to clearly read the screen. This purpose-built feature was designed to improve productivity and reduce the potential for repetitive strain injuries. In addition, the Panasonic device comes with barcode reader activation buttons on either side making it easy for use by left- or right-handed workers. Other purpose-built features include a glove enabled, multi-touch, sunlight viewable display with a rain sensing mode that delivers accurate operation, even in inclement weather. The slim and lightweight Toughpad FZ-F1 and FZ-N1 feature a drop rating of 6’ and have also passed a torturous tumble test that saw the devices endure 2,000 consecutive 3.3’ drops – so they can stand up to the abuse of the most demanding enterprise and government usage environments. The devices are fully sealed against dust and are also submersible, in up to 3.3’ of water for 30 minutes, meeting IP65 and IP67 certification requirements. Its ruggedized glass screen ensures the high level of display reliability and durability. The new Toughpad handheld tablets can operate beyond a typical 8-hour work shift on the standard, field replaceable battery, and with an optional extended life battery it can go well beyond two full work shifts. For times when a battery change is necessary during work hours, it can be accomplished while keeping the device operational. And when more power is needed, the quick charge capability delivers extended use after a one hour charge, with a full charge averaging only two hours2. Both models will be available with dual SIM slots and certified on leading mobile carrier networks, providing 4G LTE/3G/GPRS/CDMA2000 mobile broadband for voice (or VoIP) and data. To ensure clear voice communication above industrial noise, the devices are equipped with intelligent noise suppression capabilities and dual front speakers providing an astounding maximum volume of 100 decibels. Wi-Fi 802.11 a/b/g/n/ac, near field communications (NFC), standalone and assisted GPS (A-GPS) and Bluetooth®, v4.1 (Class 1) are standard on both models. A broad selection of accessories will be available for the Toughpad FZ-F1 and FZ-N1, including a vehicle dock, hand strap, single and multiple device cradles, multi-battery charger, passive and active stylus options and an extended life battery. Continuous Operation: 8 hours, Standby: 700 hours and Talk time: 24 hours3 Final operational battery results are pending and will be determined from wireless certification and final product testing. The Android™-powered Toughpad FZ-N1, will initially be available as a Wi-Fi model in March of 2016 at an estimated street price of $1,499.00, with a voice model to be introduced in summer 2016. The Windows 10 IoT Mobile Enterprise-powered Toughpad FZ-F1 will be launched as a data and voice model in fall 2016 at an estimated street price of $1,599.00. All Toughpad tablets can be purchased through authorized Panasonic handheld resellers. All products in the Toughpad family come standard with the industry's most comprehensive 3-year warranty. Besides offering the market leading performance and reliability the Toughbook and Toughpad brands are known for helping customers reduce the complexity of deploying and managing mobility projects through its ProServices suite of engineering consultations including premier disc imaging and device deployment services, training, mobility applications and break/fix depot support. With exceptional parts availability, Panasonic has an above average repair turn-around-time, ensuring minimal business and productivity disruption in the rare case a device needs service. Sales inquiries for Panasonic’s Toughpad tablets should be directed to [email protected] or 877-803-8492. For more information on the Panasonic Toughpad family of tablet computers, visit www.Toughpad.com. The Panasonic Toughpad brand can be followed on various social media channels, including Facebook, Twitter(@PanaToughpad), LinkedIn, YouTube, and our blog, Panasonic for Business. 1. As of 22nd February 2016, among handheld tablets which have 3.3’ drop resistance, 4.7” and over display and dedicated barcode reader. 2. When charging with optional charging cup or cradle. 3. Final operational battery results are pending and will be determined from wireless certification and final product testing.